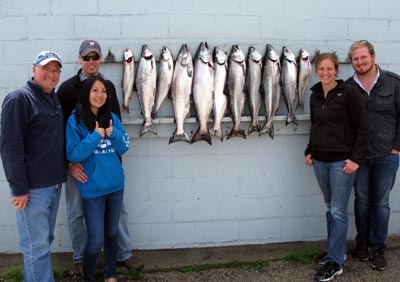 Good fishing today south of Ludington. We started out in 180 fow in the 45’s. Our chute rigger with an 11″ White DW Paddle/Pickled Sunshine Action was the first rod in. Just got the rod tightened up and it took off with a good King on the end. It was set just off the bottom. We landed it, got the rest of the rods set and didn’t take another bite until we turned east. We started marking fish in 165 fow and had good action all the way in to 130 ft. Our best rod was a 10″ White Crush Spin Doctor/Froggie Big Water Meat Rig. It took two Kings on a high wire diver out 330 and another King on a 450 copper. A 350 copper with a 10″ Chrome Spin Doctor/UV On Ice Big Water Meat Rig took two Kings. We kept the chute rigger just off bottom. It took a Lake Trout and missed another fish. Only one spoon bite. It was a mag size glow spoon stacked ten feet above a meat rig down 130 ft. Our first in troll was our best. We worked between the 45’s & 42’s going in to 130 and trolling back out 180 ft. Finally fishing! This is the latest start we’ve ever had. The cold weather and marginal fishing slowed us down. We took our shake down cruise today. There have been some Brown Trout hitting in the shallow water south of Ludington and reports of a few Kings being caught near Pentwater, but we decided to go north and try for Kings. We set up just off the bank in 120 fow and put it on a NW troll. The surface temp was 43 degrees and our Fish Hawk probe on the chute rigger down 110 was 39.9. We trolled for about an hour with no hits. Our first hit came in 230 fow. We took a bite on high wire diver out 300 ft. with a 10″ Dark Green Blade Spin Doctor with Blue Bubble tape on one side and Slick glow tape on the other ( Kevin’s Girlfriend) trailed by a Big Water Tackle Green Mile Meat rig and a Erie Dearie Premium Strip. We missed that one. That combo was our hot one. It went four times, taking two Kings. We hit a big King 150 ft down on an out down with a pair of Fuzzy Bear Frozen Veggies, a mag on the bottom & a regular stacked 10 ft. above it. The King hit the mag. We fought it for a while before it came off. We finally landed one on a low wire out 225 with a 10″ Dark Green Blade White Crush Spin Doctor /Moo Moo Meat Rig. That combo also took a nice Brown Trout. 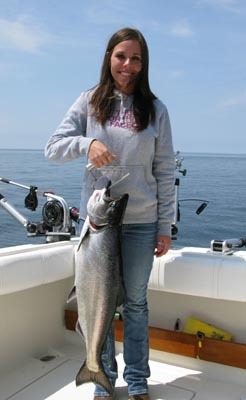 We caught a small Coho on a 10 color core on a Yeck Lighting spoon. The action was slow. We had had 9 bites, 7 of them were on 10″ Spin Doctors and meat rigs. Our fish came between the 03’s & 05’s in 190 to 230 fow. We got out as deep as 350, but had no hits out there. We marked quite a few fish in the deep water, but they weren’t too active. Our biggest fish was just shy of 19 lbs. 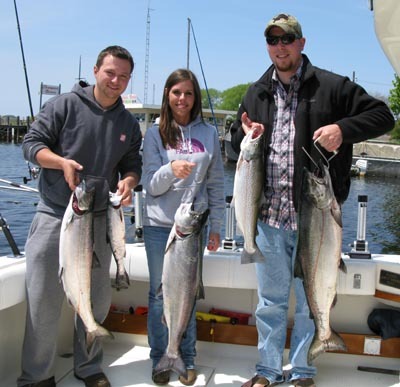 We are thinking the fishing is going to improve with the upcoming warmer weather.